The last few days of May and the first week of June, my spousal unit and I joined a tour in England and France. Of course, we had to take advantage of the opportunity to sight and photograph lots of birds that we couldn’t see back home. In England, we got most of our shots in and around London and at Stonehenge. The special guest star who appeared at Stonehenge, I’m saving for last on this page. 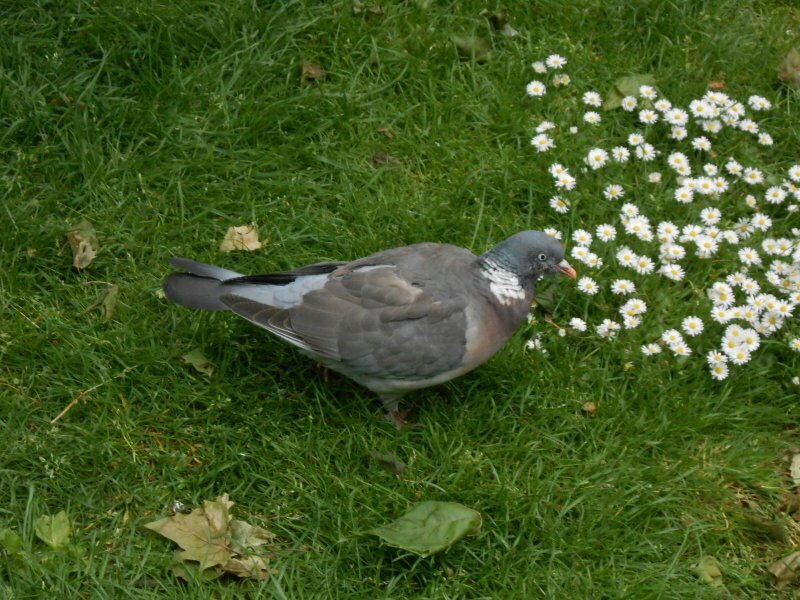 One of the most common birds comes first, the Wood Pigeon. This guy looks a bit like the Rock Doves back home, but he is quite plumper and longer. People in Europe probably see them the way we see pigeons back here, but for my husband and I they are a treat for being a bit different from what we’re used to seeing. We got to add some new ducks and geese to our list of bird sightings for the year. 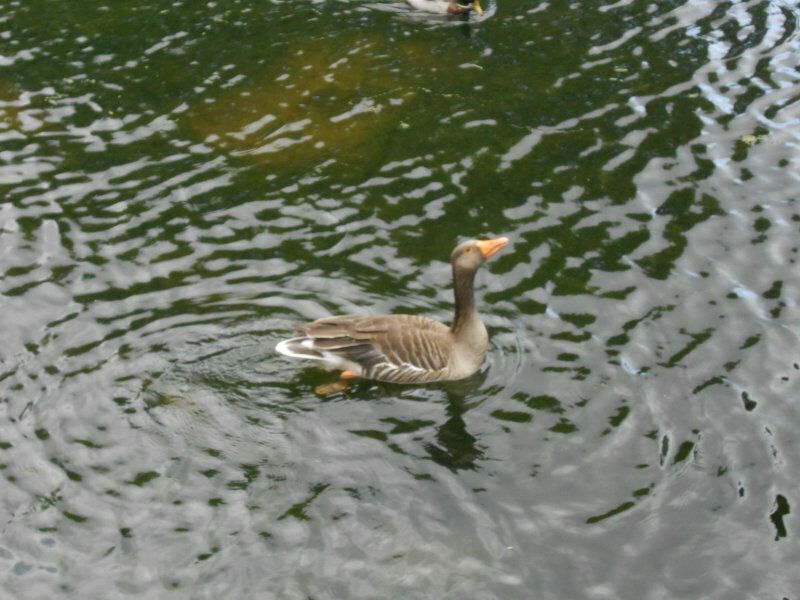 Here is the Grey Lag goose. 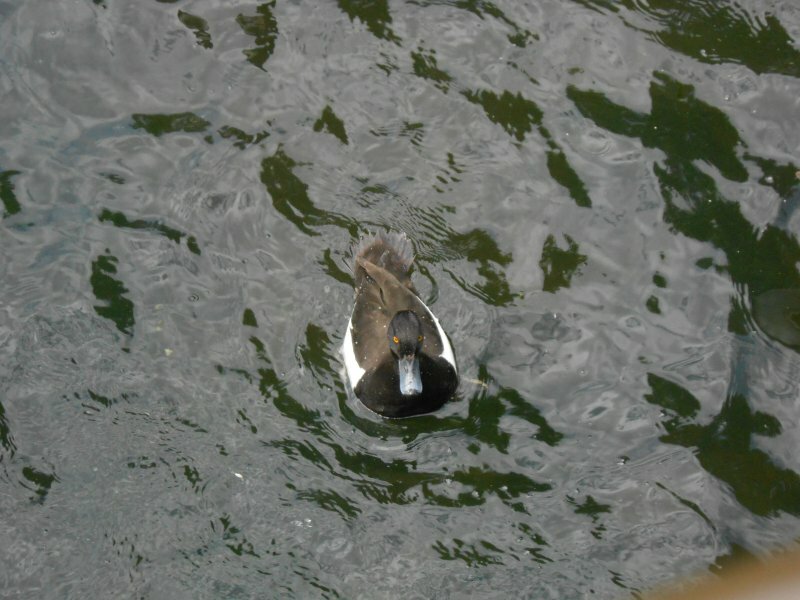 There was also another duck we weren’t quite sure of. 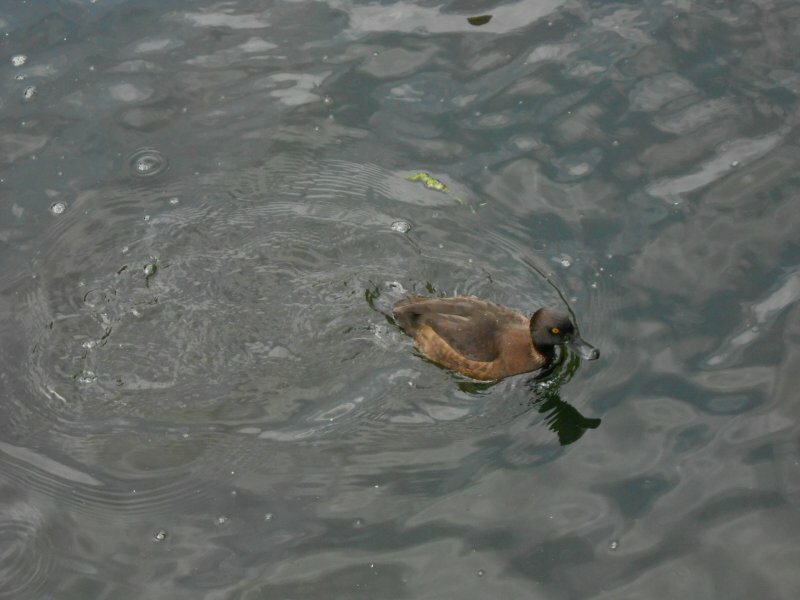 It looks like a Tufted Duck with his tuft slicked down. If anyone else can better identify these guys, please let me know. We photographed both the male and the female. Dig those crazy, Satanic orange eyes! This one is probably the male. This one looks like the female. What a lovely couple! 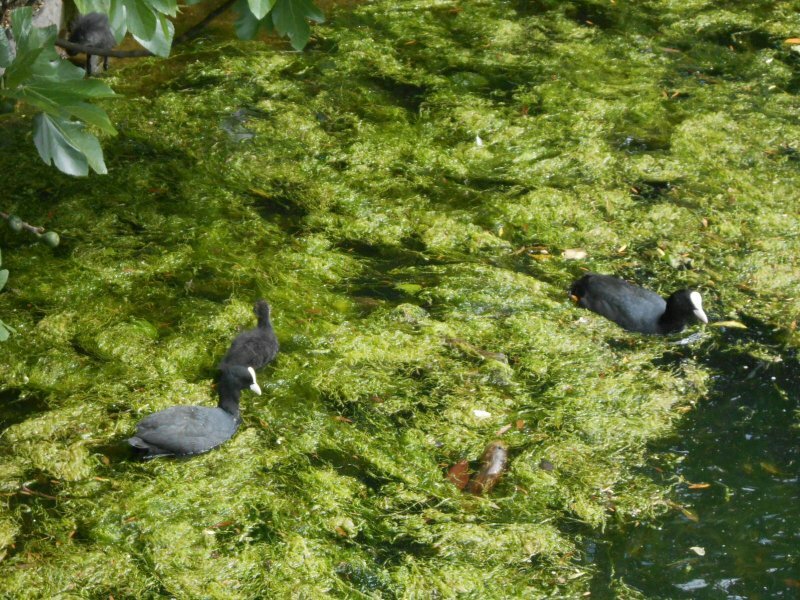 We also saw some coots, including these babies. 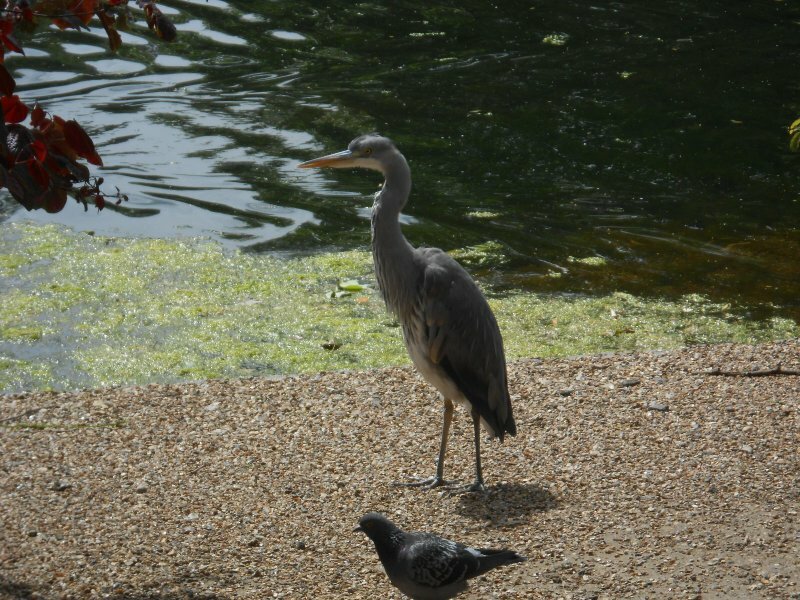 One of the prettiest of the water birds was this Grey Heron. I believe he is an immature one. Not only have the tuft feathers on his head not developed as they do on a mature bird, but he giggled anytime anyone said “underwear.” Don’t ask me why anyone did. 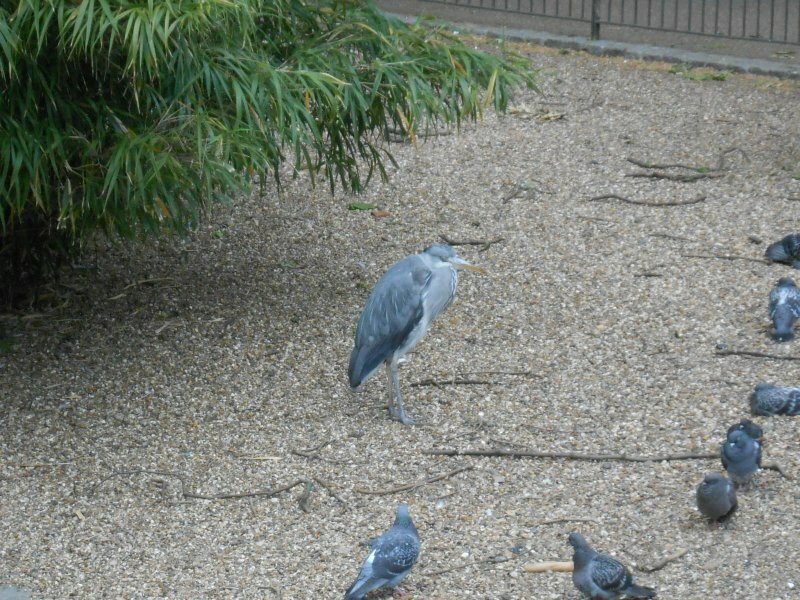 Here’s an even better shot of the heron. We also noticed there were lots more birds in the crow family here in England than back at home. 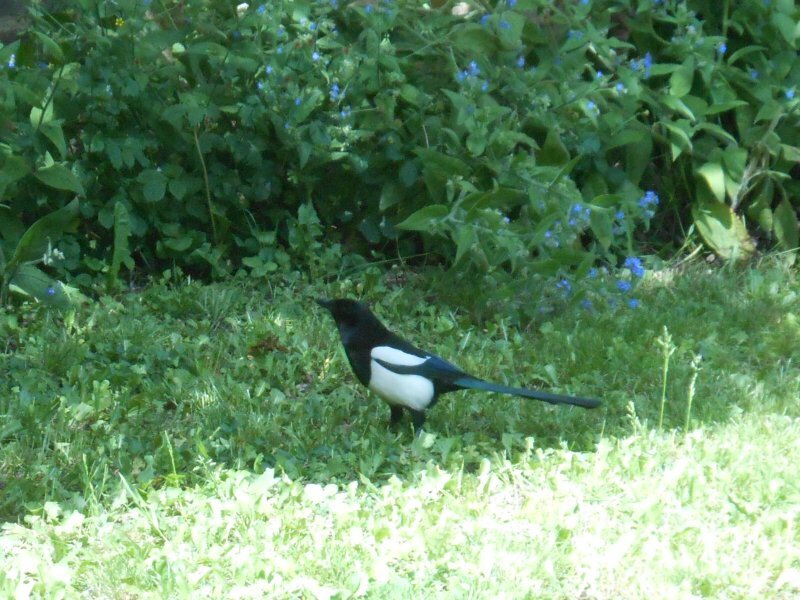 We saw this beautiful Magpie in Highgate Cemetary. Notice how the blue toward the back of his wings picks up the blue of the flowers. Did he plan that? We don’t have any of these guys in New England, but I’ve seen them on the West Coast, in California and as far east as Colorado. There are tons of them in China as well. I wonder why they never seemed to spread past the Rockies? 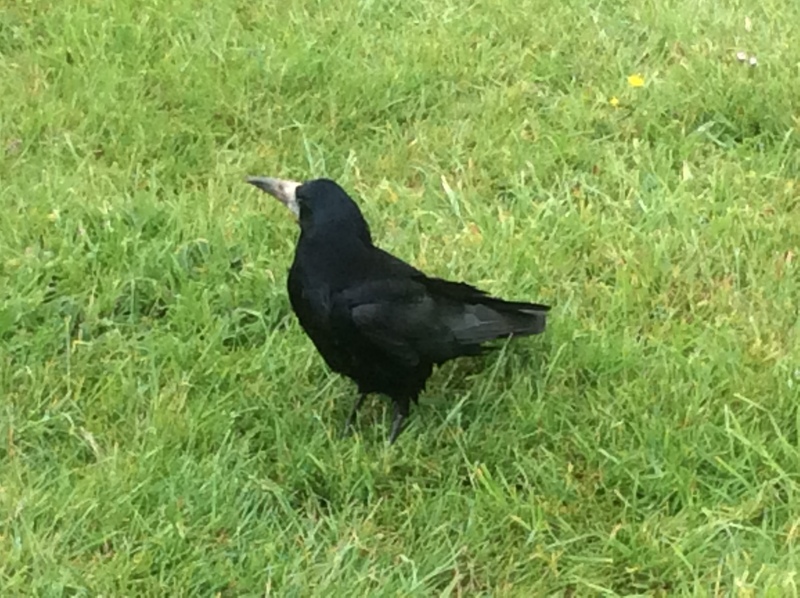 At Stonehenge, we also saw some other crow relatives, Rooks and Jackdaws. I’m fascinated by the missing feathers right above the beak on Rooks. Since Rooks are carrion feeders, does this lack of feathers help them ward off bacterial infections, as does the Condor’s and vulture’s featherless noggin? 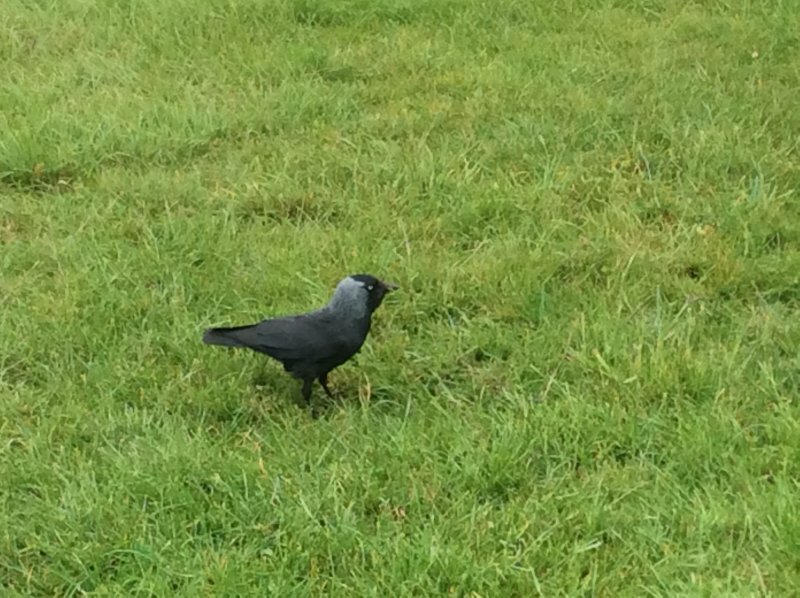 And here’s a Jackdaw. My husband loves the grey at the back of their heads. He thinks it makes them look cute. So here is the treat I promised you at the beginning of this blog! 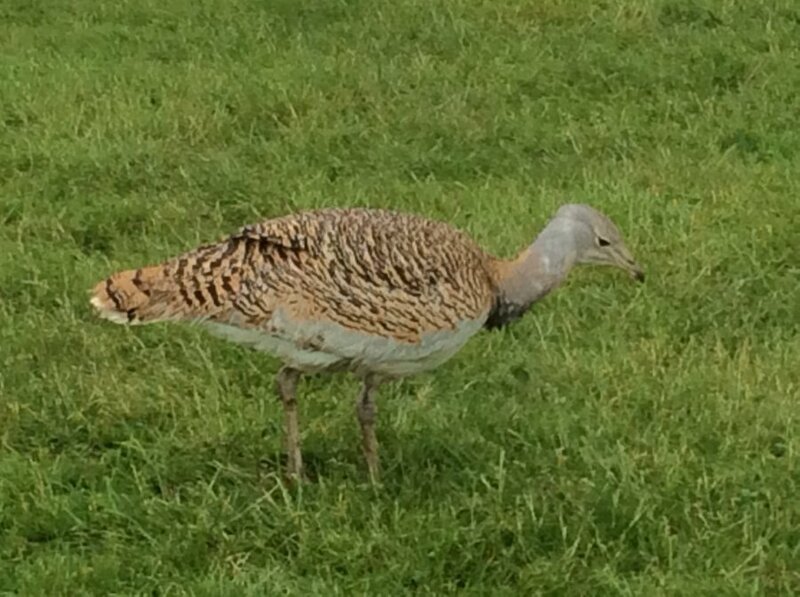 The Great Bustard! Apparently this bird was almost extinct, and the conservation people have been breeding them to bring them back to repopulate the country. 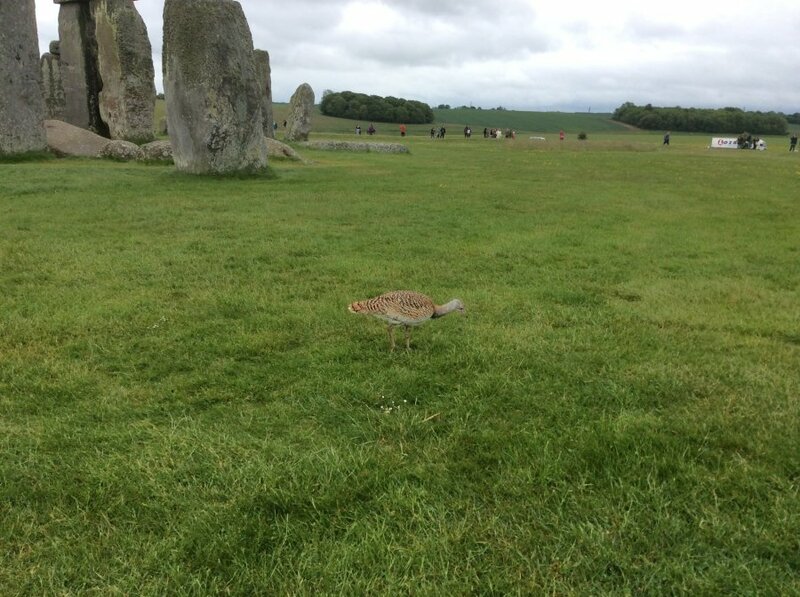 I was told that I was extremely lucky to be able to see one when I was at Stonehenge. I certainly feel lucky. Good luck to these guys making a comeback. All your bird ID’s are correct including the tufted ducks and Immature Grey heron. Thanks to Hethersett Birdlife for letting me know I idenfied all the birds correctly! I like the magpie. You’re probably right about the missing rook’s feathers. 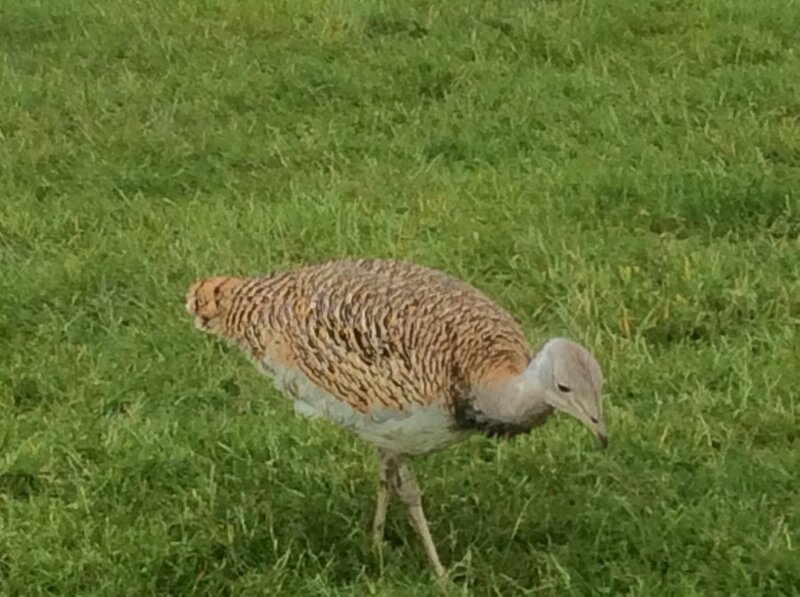 May the great bustards make a come back….and they look prehistoric! It’s funny you said that about the Bustards looking prehistoric. I was thinking the same thing.